France is an hour ahead of England but shares the same longitude, so we have the same light for a given moment but call 7 o’clock, 8 o’clock, if you see what I mean. This means, for the same amount of daylight, that while it stays light for an hour longer in the evening, mornings are uncharacteristically (for us ex-pats) dark. And it’s cold too, both of which inhibit the impetus to jump out of bed, put the kettle on and then do the morning rounds of the animals. There are some jobs that have to be done during winter, so while I’m looking forward to being warmed by the spring sun and anticipating primroses and bluebells breaking bud in our woodland, I’m also hoping it doesn’t come too soon. Woodcutting takes place in the winter, when the energy of a deciduous tree has descended into the roots and before the sap starts to rise again. Thanks to the sterling efforts of our tree surgeon volunteers last week, Paul and Liam (ably assisted by 13-year-old Chay) our tree felling is done for this winter. Complete rods can be replaced by cutting the ties, pulling the dead rod out, then threading a new rod in from the top, pushing it into the original hole (to a depth of 12 inches / 30 cm) and firming the soil around it. Where you have a rod that died after a certain point, trim off the dead wood and then tie in a suitable new growth to replace it. Obviously you need to choose which rods you’re going to use before you do the pruning. The first photo with the red arrows shows a rod whose top has died. I’ve trimmed the dead part off and pulled a new side shoot up and over, tying it to where the original rod was fixed. 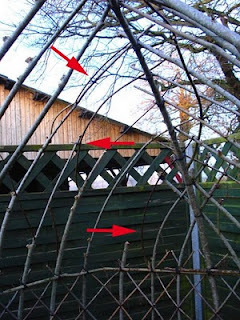 The second photo with arrows shows several variations on that theme (from left to right) : leaving a dead rod in to act as a trainer to the new rod (i’ll cut out the dead one next winter). Pulling over a side shoot over from an adjacent rod and tying that in. And lastly, an example of just using whichever available new rod seems to make the best shape. If they lend themselves to it, you can weave in new shoots, rather than trimming back absolutely every rod back to the original structure. This will make a denser structure, if a little less regular than the original form. A question we’ve often been asked is, “does the structure get bigger as the willow grows?” The structure remains the same size and shape but the rods do get a little thicker. Their ability to put on lots of girth is restricted by the closeness of the rods to each other, which restricts the moisture and nutrients available to each rod, so tempering their growth. 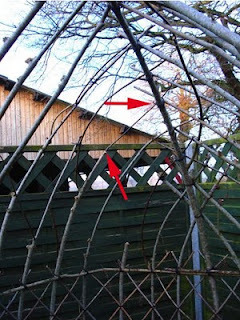 See the photo of the base of our arbour, in the third winter after planting. 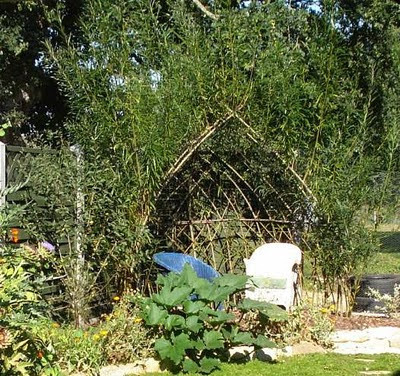 If you want to do a course to learn how to create beautiful living willow structures, there’s no better people to guide you than Steve and Carine of The Willow Bank. And to warm the cockles of your heart, a photo of the same arbour in the summer. we have great trouble being allowed to plant willows in oz as they have been declared a weed. you may be interested in the work of peter andrews () and his natural sequence farming method. he LOVES willows and uses them to repair damaged waterways. 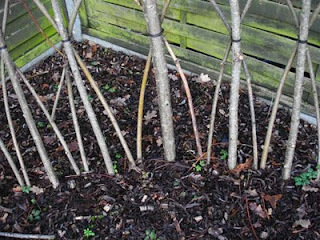 i have a whole lot of willow cuttings that we snipped from a tree that we tracked down in sydney (there are hardly any left) and i would love to try a living fence. yours is beautiful. I've just (very belatedly!) seen your comment on my post on co-housing and am so super-stoked about your synchronous finding it, but especially to have seen your own blog and see how far you have come: amazing, thankyou! I shall enjoy reading more. beautiful Willow fence btw...how long has it been established? Weed, eh? Do you know whether Australia has any indigenous willows? I'm not sure that you could call it invasive as seed needs to fall on wet earth or it dies, hence the reputation it has for liking water and it will hug river courses, where it will help prevent bank erosion. 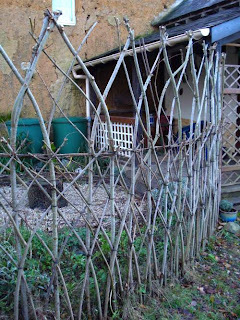 It may be possible to create a similar fence using a native Australian plant, something that grows in straight rods. You could invent a new fedge! This is the third winter after planting for the willow structure. We'll be building a long fedge very soon to enclose our new pond. I just stumbled upon your blog. I am in the process of buying a house and five acres with my partner to start a permaculture farm. Your blog is a great source of inspiration and information. Thank you! I'm really pleased that you like the blog, it means a lot to me that you've taken the time to post a comment and tell me. I enjoy writing it and it's helped me to improve my writing skills. 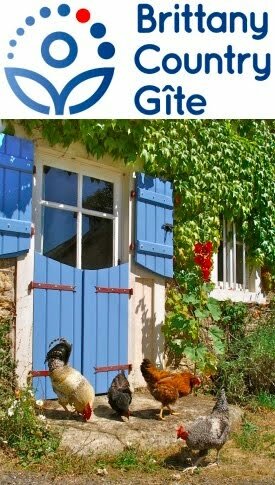 My next magazine article is coming out in the March edition of Country Smallholding Magazine; it's called "The Strange World of a Broody Hen>"
You're very welcome! I think you write very well: with a natural, well balanced style that is both informative and good humoured! Just wonderful. Like above, I am in Australia and yes it is declared a weed here. You are correct in saying that it hugs the water course and needs wet feet, that is what makes it a weed here. We don't have constant high flow waterways and the willows have a bad reputation for choking up the system which has a flow on effect. I guess that occurs with any species introduced without any type of control. I do so love the willow arbours though. They look so much fun for the kids.